It’s fair to say that Flick has had a terrible year. Her beloved father died, she had the wedding of her dreams and only hours after the ceremony her husband ran out on her. Brenda, fed up of her daughter living like a hermit, decides to drag Flick off to France to stay in a chateau. What could be better than an idyllic escape? But when they arrive Flick discovers the chateau is all but abandoned. The only upside of her French escape is the handsome and mysterious neighbour, Nate. Can Nate and Flick ever learn to come to terms with the past and find love again? 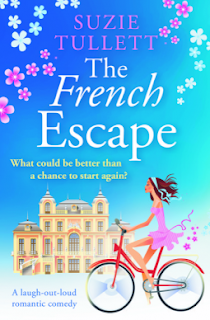 The French Escape is a heart-warming, happy ever after, love story. Follow Flick and Nate’s laugh out loud and emotional journey as they negotiate matters of the heart and learn to trust again. Every now and then a book will attract me purely on cover, and possibly title and without really paying it any closer attention I end up with it on my kindle. This is one such book, the author has bene on my radar for a while as one I should try reading, so when this gorgeous looking book popped up I just couldn't resist. And I'm delighted that my impulsiveness paid off, as this was a truly enjoyable story, and I will be adding the rest of this authors books to my wish list! I tried my hardest to feel sorry for Flick, after all in recent months her father has died, and her groom ran off shortly after saying I do, but then her mum persuades her to take a trip to France and the next thing we know she is heavily involved with a Chateau, and a show bunch of friendly people in a small Breton village. While Flick is trying to get her head around everything, I was far more intrigued by Nate, who lives in a cottage in the grounds of the chateau and is clearly hiding something. It was his story that had me wondering what was going on, and reading on to find out more. I loved Flick though, and her mother Brenda and really enjoyed seeing how they were trying to get used to the French way of life. I really loved all the villagers too, they were so friendly and welcoming, each with their own quirks. This is pure escapist reading and when reading it on a tube, I had no idea where I was most of the time, I must have gone past 5 or 6 stops without even noticing - very thankful I didn't miss mine - but I was so engrossed in how everything was going to resolve itself, that I was lost to the real world. Charming and thoroughly enjoyable, I am so pleased I took the chance on this book and definitely will be reading more from the author. Thank you to Netgalley and Bombshell Books for this copy which I have reviewed honestly and voluntarily.